The Cesky (Czesky) Terrier, also known as the Czech Terrier, originated in Czechoslovakia as a manmade breed developed by geneticist Dr. Frantisek Horak. Dr. Horak, a well-respected breeder of both Scottish and Sealyham Terriers, was seeking a breed for both going to ground and for hunting in the open field. 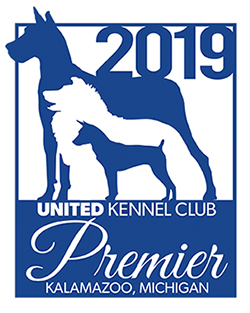 Dr. Horak's cross-breedings of these two Terriers, beginning in 1949, brought the results he desired in a relatively short period of time, with the new stock breeding true by 1959. It was recognized by the Federation Cynologique Internationale in 1963. The Cesky Terrier was recognized by the United Kennel Club on January 1, 1993. 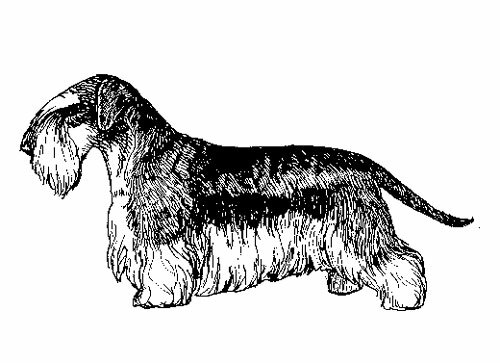 A short legged, well-muscled and solidly built terrier, rectangular in proportion, with long hair and drop ears, developed to hunt fox and badger. Unlike most of the other terrier breeds, the Cesky is trimmed by clipping, instead of stripping, and the tail is undocked. The Cesky is a pleasant and cheerful companion dog, easy to train and not aggressive. Bred to hunt both singly and in packs, the Cesky is calmer than the other terriers. The breed can be reserved with strangers. A long, blunt, not too broad wedge, with divergent planes of the skull and muzzle and a slight but apparent stop. Moderately broad between the ears, tapering in width slightly towards the eyes. Prominent occiput. As long as the skull, with fairly prominent cheekbones and strong jaws. Lips are tight and fairly thick. No tendency to be weak or snipey. Faults: Small teeth. Missing teeth, except for the first premolar in the bottom jaw. Medium size, set somewhat deeply. The expression is friendly. Eyes are brown to dark brown in blue-gray dogs and light brown in the light coffee brown dogs. Eye rims are black in the blue-gray dogs and liver in the light coffee brown dogs. Faults: Eyes too large or protruding. Entropion. Ectropion. Large, with well-developed nostrils. Black in the blue-gray dogs, and liver in the light coffee brown dogs. Triangular in shape, medium sized. A typical dropped terrier ear, rather high set and falling flat against the cheeks. Faults: Ears too short or long, or carried differently than described. Medium long, strong, well carried but not upright. Skin at the throat is loose, but without forming a dewlap. Shoulders are muscular with well-laid-back blades. Elbows are loose but do not protrude. Straight and parallel with good bone. Brisket is round, rather than deep. Ribs are well sprung. Back is strong to slightly arched loin, croup is muscular and moderately sloping, with hipbones slightly higher than withers, giving the breed a distinctive topline that is not level. Tuck-up is slight. Correct proportion is approximately 1½ times as long (measured from brisket to rump) as tall (measured from withers to ground) but overall balance is more important that specific measurements. Parallel when viewed from the rear, with a rather short, well-angulated lower thigh and a somewhat long rear pastern and a strongly developed hock joint. Thick pads, well arched toes and strong nails. The front feet are larger than the rear feet. Undocked, seven to eight inches in length. Thick and low set. At rest, the tail hangs down with a slight bend at the tip. In motion, it is carried saber like, at horizontal or higher. Faults: Tail curled or carried over the back. The hair is soft, fine but firm, slightly wavy and has a silky gloss. Furnishings long but not excessive. The coat is clipped and scissored, never stripped. The head is clipped, leaving a fall of hair over the eyes that blends into the beard. On the top of the neck and the back, the hair should be trimmed to ½ inch in length, blending smoothly into the longer furnishings on legs, sides and underbody. Hair on the ears, cheeks, throat and around the vent should be quite short. Skin is firm, thick and pigmented. Cesky Terriers come in two basic colors: blue gray and light coffee brown. Blue gray dogs are born black. Light coffee brown dogs are born chocolate. Yellow, gray and white markings are permissible in both colors. These markings appear on the head, on the cheeks and underside of the muzzle, on the neck, chest, belly, the lower parts of the legs and on the tip of the tail. There may occasionally be a white collar on the front of the neck. The basic color must predominate. Faults: A long brindled coat on dogs over two years old. White markings that cover more that 20% of the body. A white blaze on the head. Preferred height for males is 11½ inches; for females 10½ inches. Preferred weight range is 13-20 pounds. Faults: Any dog weighing under 13 pounds or over 22 pounds. Free and vigorous, with the forelegs extending straight without convergence.